Do you have extra fat under your chin that you can’t seem to get rid of? If you can’t get rid of your double chin at the gym or with a healthy, balanced diet, then Aesthetic & Dermatology Center may have the perfect solution for you: Kybella. Dr. Green has been selected as a Kybella trainer for other doctors, meaning that he is considered an expert in this treatment. During the clinical trials phase, Kybella treatment was pioneered at the Aesthetic & Dermatology Center. Kybella is a non-surgical procedure that is specifically designed to dissolve packets of fat cells in your chin. By utilizing a synthetic version of deoxycholic acid, Kybella is literally able to break down and absorb the excess fat under your chin. Deoxycholic acid is a naturally occurring substance in your body that breaks down fat cells. After your consultation, your board-certified dermatologist will determine how many treatment sessions are necessary to achieve your desired results. Each injection generally lasts anywhere from 15 to 20 minutes, and the number of injections is determined by your dermatologist. 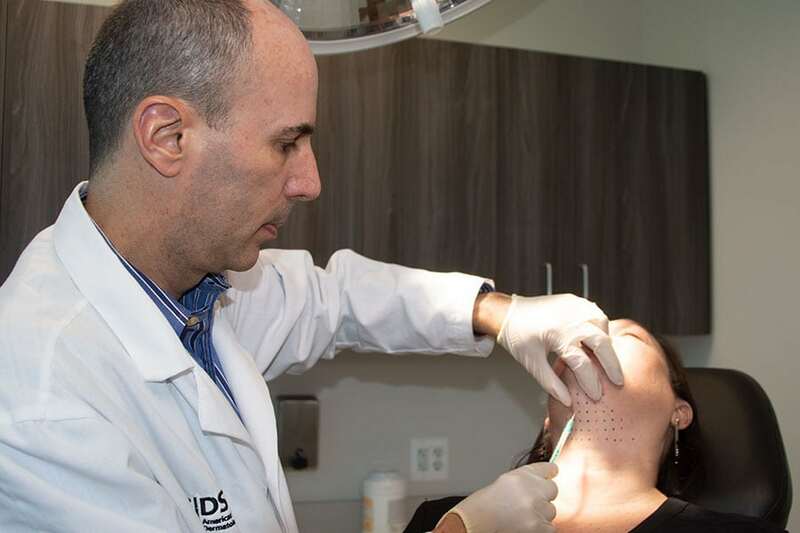 When your board-certified dermatologist at Aesthetic & Dermatology Center injects Kybella into the area beneath your chin, not only will it reduce the appearance of excess fat cells in the area, but it also makes those cells unable to hold fat in the future. Thus, after the fat has been dissolved, it should not recur. 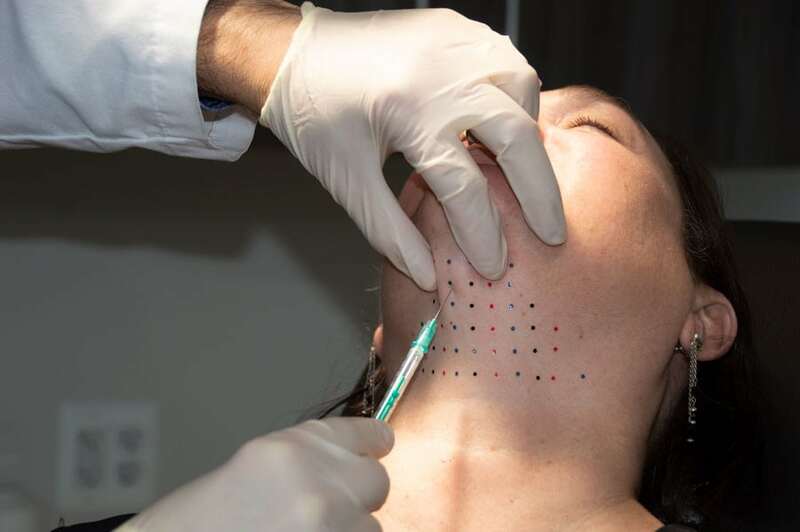 Before you are treated with Kybella, you will have a consultation with one of our board-certified dermatologists to discuss your health history and aesthetic goals to ensure that it is the right choice for you. During this consultation, your dermatologist will perform an examination of the area at and around your chin to develop a personalized treatment that is specifically designed to meet your needs. At the Aesthetic & Dermatology Center, only our board-certified dermatologists perform this treatment. Kybella is a specialty treatment, only people who are specially trained can administer the treatment. Because of his skill and experience during clinical trials, Dr. Green of Aesthetic and Dermatology Center was an original member of the Kybella Nations Physician Trainers. Furthermore, he currently trains other doctors how to use this fat-reduction treatment. As with any injectable treatment, Kybella may cause side effects. Your board-certified dermatologist will discuss these side effects during your consultation. If you want to know more about how Kybella can get rid of that stubborn double chin fat and give you the confidence boost you’ve been looking for, call our office today at (301) 610-0663 to schedule your appointment, or you can request an appointment online.